Post a comment — Trackback URI RSS 2.0 feed for these comments This entry (permalink) was posted on Saturday, January 19, 2008, at 3:36 pm by Danilo Cesar. 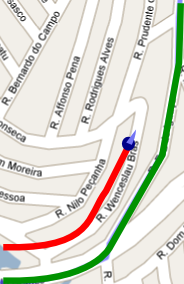 Filed in GPS, Linux, Maemo and tagged Brazil, GoogleMaps, GPS, Hacking, Maemo. I had the same problem in a trip I did from Brasilia/DF to Cavalcante/GO (Brazil). My problem was not so big (200m)… I hope that in Sorocaba the problem be not so big too =). 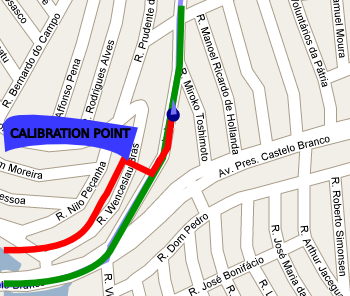 SO if i understand you right, it IS possible to navigate in brasil with GPS? No matter where u are? Maps in Québec also seems to be off. After I saved my track from Maemo Mapper and converted it to KML for Google Maps: although I was right on the street on Maps (on N810), I was in between streets in Google Maps..
@2beers: Yes, off course that is possible. But, where you are matter, and what application you are using matter too! GoogleMaps + Maemo-Mapper works very well in my City, but another solutions (like navcore) doesn’t. And I don’t know how googlemaps works in São Luis… You can verify it using the “Satelite” map and see if streets are exactly on their real position on the satellite map. @Pierre-Luc: Hi Pierre! Thanks for you comment. So, you can have a little problem (that I’m working on to fix). The problem is that when you use my patch, GPS coordinates are be changed, so if you save your track you will have non-corrects coordinates. Can you see the question here? The problem is with GoogleMaps, but we can’t not “fix” googlemaps, so I adapt the GPS to GoogleMaps. But when GoogleMaps fix their problem, your track will be wrong….